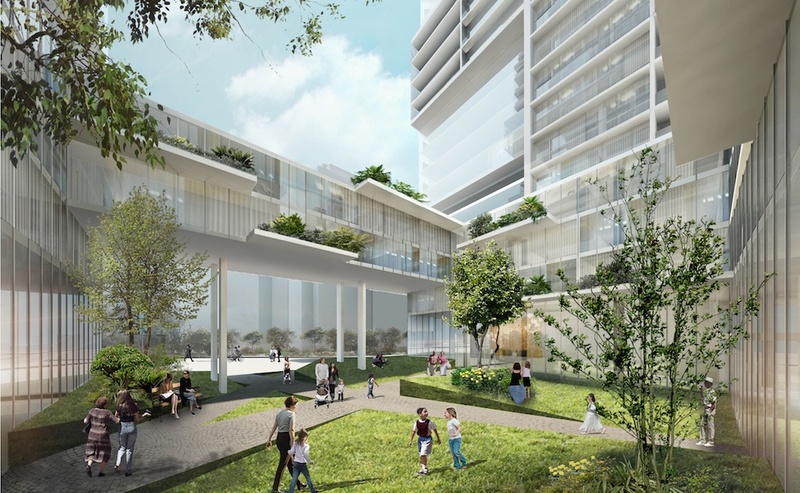 Designed by renowned German architect Ole Scheeren, Bosa Properties and Kingswood Properties are proposing to transform 1040-1080 Barclay Street with a mixed-use development that includes market and social housing, a City-owned childcare space, commercial retail units, a variety of amenity spaces, and a lushly landscaped central courtyard. 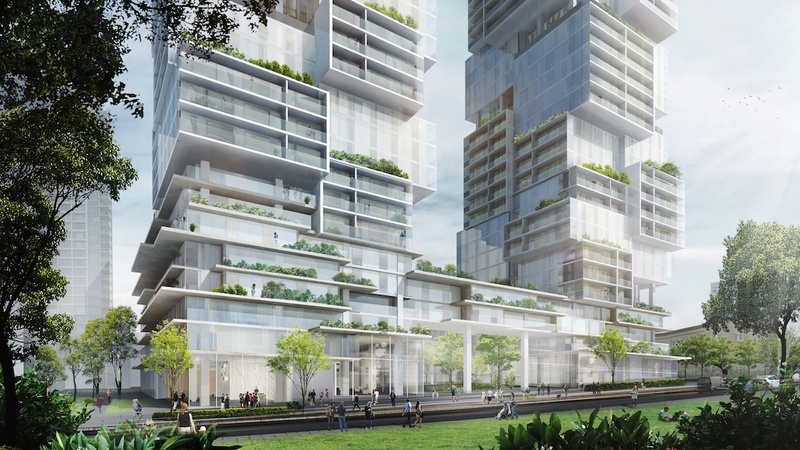 Open terraces and sky gardens extend the greenery and landscape from the courtyard and connector levels, upwards into the towers, populating the residences with outdoor green spaces. Larger recesses in the tower massing accommodate duplex townhouses with their own “front yard” at higher elevations with views of the city. 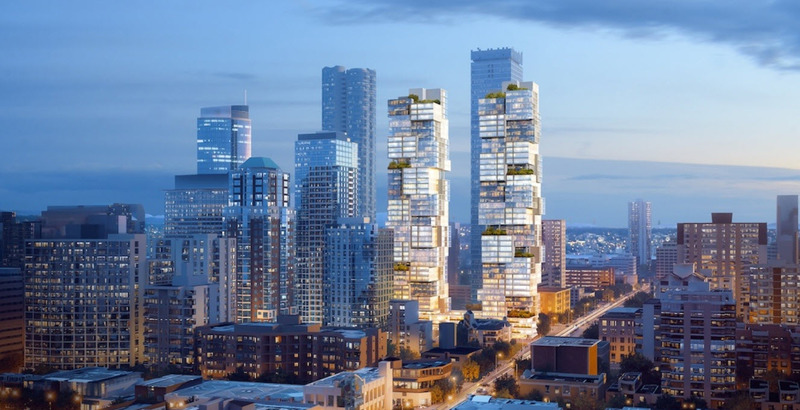 The stunning design of the twin towers takes its inspiration from the grain and scale of the horizontal villages and transforms it into a vertical village that articulates the experience of living in Vancouver’s unique balance of vibrant urban conditions surrounded by breathtaking nature. Situated in close proximity to the greenery of Nelson Park, the liveliness of Robson Street and Davie Village, and the bustle of the Central Business District, 1070 Barclay is an appealing location for downtown living. This development is currently in its application development stage. For those with a serious interest in owning a unique home created by an exceptional development team, sign up now to our VIP list for priority access to 1070 Barclay updates. A 5,894 sq ft daycare centre is located on level 5 of the east tower, along with 4,957 sq ft of dedicated outdoor play space on the connecting bridge deck. On the deck of the north bridge are market residential terraces for each tower that include amenities such as outdoor barbecue areas, dining spaces, and informal seating. A green space with a pathway connects these two areas, creating a more flexible shared space. The rooftop of the south bridge is dedicated to elements of urban agriculture and an informal children’s play area, taking advantage of the better access to sunlight and allowing residents to use the space as a family. At ground level, there is 4,520 sq ft of commercial space located on the Thurlow Street that is divisible into several units and can include a cafe or deli. A fitness room, yoga room, and lounge is located off the lobby in each of the towers. Both market residential lobbies face Barclay Street on either side of a generously-planted courtyard that creates a green buffer space, allowing each tower to be contained in a park-like setting. The idea of the garden-scape is extended to the rest of the tower mass with the inclusion of planters that add a layer of green to the tower facades. These will be planted with a combination of low growing evergreen and deciduous plants to create low maintenance and visually attractive green pockets. accessible from the lane at the back of the building. This development is a collaboration between Bosa Properties, Kingswood Properties, Büro Ole Scheeren, Francl Architecture, and PFS Studio. 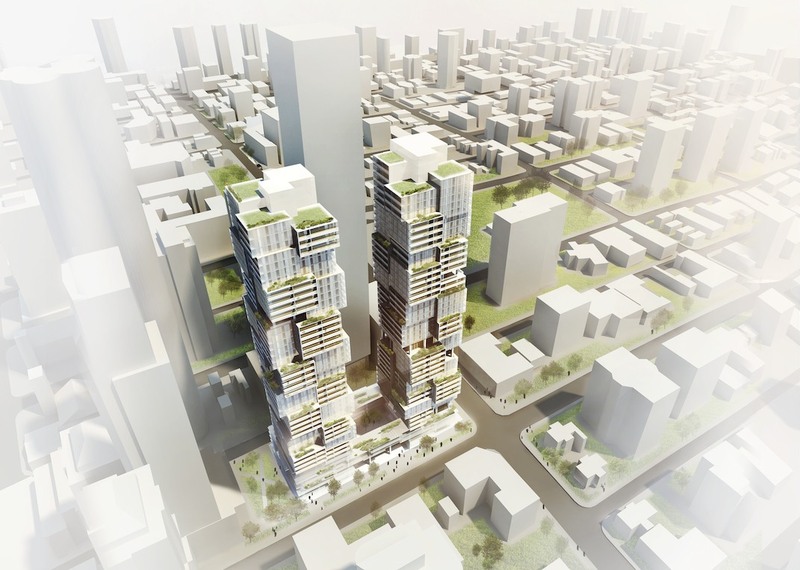 Büro Ole Scheeren has been commissioned as the lead design consultant for 1070 Barclay. Büro-OS is an international architecture firm that practices architecture, urbanism, interior design, and research. They have a worldwide team of more than seventy international architects and designers. Ole Scheeren is a German-born architect and the principal of Büro-OS. His projects have won numerous awards, including World Building of the Year 2015. Francl Architecture is the collaborating architect for 1070 Barclay. Over the past 25 years, Francl Architecture has established a strong track record of efficient and elegant projects that are attuned to the unique social and physical textures of the City of Vancouver. Led by principals Walter Francl and Stefan Aepli, most of the firm’s work is located within the City of Vancouver itself. This gives the firm an intimate knowledge of the evolution of the civic fabric and an awareness of its potentials.